Executives' pride in Vauxhall's Ellesmere Port plant having secured the contract to be the lead factory for the new generation Astra was palpable at the UK media launch. It was clear that union flexibility was the key to the British plant getting the nod over the Germans - securing 2,000 automaker and supplier jobs until at least 2020 - and led to Bochum, instead of Ellesmere Port, facing the axe. No more British built Astras would also have meant no more British Vauxhall cars (the former Luton car plant is now a development site) and no more Ellesmere Port. This latest Astra was designed by a team led by Britons Mark Adams and Malcom Ward. Vauxhall/Opel design director Ward has followed in the footsteps of both his father and grandfather who worked at Vauxhall. The factory, near Liverpool in north west England, is a major exporter with 52% of production going to 25 European markets. At full production it is estimated the plant will build around 680 cars per day and 120,000 per year. It takes about 24 hours to build an Astra, from sheet steel to the finished article, although once the plant reaches its final running speed this is expected to be down to just 22 hours. The other Astra plant in Europe is Gliwice, Poland which will continue building the current Astra GTC/VXR till mid-2016 and the 'old' three-door models will continue to be sold alongside the new-generation five-door hatchback and Sports Tourer wagon/estate for a while. 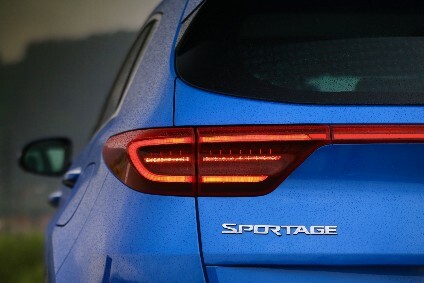 The next generation Opel Astra OPC and Vauxhall Astra VXR to be launched in 2016 or 2017, powered by a turbocharged 1.6-litre petrol engine, will change body styles and have five doors as the GTC (three-door) will not be replaced - it is most popular here in the UK. Local content in the British built cars has doubled from around 12% to 25% though big ticket items like the engine/transmission continue to be imported from Europe. That means a 38% increase in spending with UK suppliers over the life of this model generation - estimated at GBP1.4bn. Without being specific, Vauxhall told us they have been working with other UK automakers like JLR and Toyota to get parts volumes up enough for suppliers to justify making new lines here in the UK, rather than importing them, usefully shortening the supply chain. Astra as a Vauxhall nameplate dates back to the T80 'Mark 1', Opel/Vauxhall's first front-drive car. Production started at Bochum in 1980 and Ellesmere Port followed. Production there effectively replaced the rear wheel drive Vauxhall Viva and T-car platform Chevette 'world car'. The Astra is a world car too, sold in many markets as an Opel, Vauxhall, Holden and, in China, where it is locally made, as one of two generations of Buick Estelle concurrently on sale. GM reckons 12m European Astras alone have since been sold (the new one is generation seven), 3m of those in the UK, and that 28% of Britons have driven at least one. Astra accounts for 12% of UK C-segment sales against key rivals Ford Focus and Volkswagen Golf. Customer profile is "very diverse" and fleet/retail split is 70/30. This is the first new Opel/Vauxhall to be available with OnStar, GM's personal connectivity and service assistant which offers a range of safety and comfort services broadly similar to those in the US. If an airbag deploys, OnStar is alerted automatically and an advisor will then contact the vehicle to determine whether help is required. If there is no response, emergency responders are immediately sent to the location of the vehicle. Drivers and passengers can reach OnStar 24/7 and 365 days a year and the system also makes the Astra a 4G LTE mobile Wi-Fi hotspot. Up to seven devices, from smartphones to tablets, can be connected simultaneously and, for those with privacy concerns, it is possible to turn the vehicle locator off, unless help is required. A new generation of the IntelliLink infotainment system also makes its debut in the Astra. It is compatible with Android Auto and Apple CarPlay. Each system builds off the features smartphone users rely on most. Android Auto is built around Google Maps, Google Now and the ability to talk to Google, as well as a growing audio and messaging app ecosystem that includes WhatsApp, Skype, Google Play Music, Spotify, and podcast players. Apple CarPlay takes the iPhone features that occupants would want access to while driving and puts them on the vehicle’s display. This allows drivers to make calls, send and receive messages and listen to music from the touchscreen or by voice via Siri. Apple CarPlay supported apps include Phone, Messages, Maps, Music and compatible third party apps. The functions can be controlled via an up to eight-inch touchscreen located high on the centre stack, via remote control on the steering wheel (volume) or via voice control. Body design and production talking points include very sharp radii side creases and laser brazing so no roof rail is required to cover a seam seal. As well as making the new Astra slightly smaller than its predecessor (5cm shorter, 2.5cm lower on a wheelbase 2cm shorter), GM Europe has also made it 120kg-200kg lighter with 80kg alone coming out of the body in white (reduced by 20 per cent from 357kg to 280kg) and 50kg from the chassis through the use of high-strength and ultra-high-strength low-weight steels, more compact subframes and weight reductions to the front and rear axle. Brake size was reduced and front-rear weight distribution is now 60/40 - "perfect for front wheel drive cars", we were told. Further size- and mass-optimisation measures included: lighter engines (thanks to its aluminium block, the new 1.4-litre ECOTEC engine is 10kg lighter than the cast-iron block of its predecessor), lighter exhaust system (11.5kg), smaller wheels and tyres (up to 11.5kg less) and 10kg from the aforementioned smaller brakes (with better braking performance. The new seats are smaller and 10kg lighter thanks to new packaging, lighter polyurethane foams and ultra-high-strength steels. Drag coefficient is 0.285, compared with 0.325 for the outgoing model. Launch engines for the UK are all turbocharged with a normally aspirated petrol to come, along with a 200hp turbo petrol and a 160hp diesel. Entry level motor is the Adam's one-litre turbo Ecoboost with a five-speed manual that punches way above its weight and was a hoot to drive over twisty, smooth North Wales roads. Once all are on sale, power outputs will span 100hp to 200hp, including a new 1.4-litre 150hp ECOTEC Direct Injection Turbo and the recently-launched 1.6-litre CDTi 'Whisper Diesel'. Five-or six-speed manual transmissions are standard with six-speed automatic optional for the 150hp 1.4 petrol (from early 2016) and 136hp 1.6CDTi. From the same family as the one-litre, three-cylinder Corsa, Adam and Viva, that new 1.4-litre 150hp ECOTEC Direct Injection Turbo is an I4 petrol unit that delivers maximum torque of up to 245Nm, with maximum power available between 1,800rpm and 4,000rpm. A version also is available with 125PS but identical maximum torque. It weighs less than the outgoing unit with aluminium engine block 10kg lighter than the cast iron block of the previous 1.4-litre Turbo. The engine is designed to be as light as possible with a hollow cast crankshaft and low friction pump that works at two pressure levels. NVH (noise, vibration, harshness) was a key goal during development and the engine block was constructed with resonance reduction in mind, resulting in splitting the oil pan in two, integrating exhaust manifold with the cylinder head for noise reduction, a sound-absorbing cam cover, decoupling the high-pressure injection valves and "trimming the timing chain for quiet concentricity". From later this year, an all-aluminium 1.4-litre ECOTEC with 100PS and 130Nm will be an alternative entry level option. There are three versions of the 1.6 CDTi Whisper Diesel - 110hp, 136hp and a BiTurbo version with 160hp. The 110 ecoFLEX variant has the lowest CO2 emissions in the range at 82g/km and is also the most efficient, achieving 91.1mpg on the EC combined test cycle. Emission equipment includes a high-pressure, common-rail fuel injection system and LNT catalytic converter for nitrogen oxide (NOx) . The Lean NOx Trap (LNT), an exhaust after-treatment system upstream of the diesel particulate filter, captures and removes nitrogen oxides from the exhaust gases without the use of additives. For this Astra launch, Vauxhall wanted UK media to assemble at dusk for an early evening drive, unusual. The reason was so we could try the new, glare-free 'IntelliLux LED Matrix' headlights. Not long ago, these were the preserve of top premium models but have already migrated down to the C-segment. Consisting of 16 LED segments (eight each side), the LED matrix system automatically and constantly adapts the length and distribution of the light beam to every traffic situation. It works in conjunction with the front camera system which detects the presence of other vehicles and then switches off the individual LED segments, preventing other road users from being dazzled. As soon as the vehicle exits urban areas, provided you have pressed a smalll button on the indicator stalk, the high beam lighting is automatically switched on and always remains on. This leads to a considerable increase in safety, as confirmed in a study conducted by the Technical University of Darmstadt and the European LightSightSafety Initiative, according to Vauxhall. The study showed that at driving speeds of 50mph, drivers detect objects at the side of the road around 30m to 40m sooner than with conventional Halogen or xenon dipped-beam lighting. This gives them around 1.5 seconds more time to react. When the camera detects light sources from oncoming or preceding traffic, individual LEDs in the relevant zone are deactivated, simply cutting out the area around the vehicles. The rest of the road and its surroundings remain brightly illuminated. In addition to the many automatic low and high beam pattern variations, IntelliLux LED also provides a special highway light mode that further increases safety at night. And a welcome light function is provided for entering and exiting in the dark. Vauxhall claims a considerably longer running life than headlights with halogen or xenon lamps and noted that mechanical movements are no longer necessary in the headlight – the individual LED segments turn on or off according to the situation, which also contributes to a durability that far exceeds the lifespan of a car. A tourist mode can be activated through the personalisation menu. This adapts the lighting functionality from left hand drive to right hand drive or vice-versa. It works a treat and try, as we might, we could not dazzle other road users - as soon as you come up behind another car, the lights 'dip' and they can detect oncoming traffic the other side of a dual carriageway/motorway even with a solid centre barrier. The way the lights constantly adjust the beam to illuminate as much of the road ahead (or the corner you're taking) as possible, without dazzling other drivers, is very impressive. 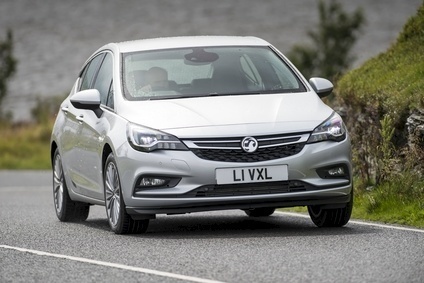 Vauxhall introduced a load of 'available' driver assist items with the previous generation Astra and these carry over along with new features - forward cameras (to read speed signs), collision mitigation, lane departure warning and lane keep assist, blind spot alert, etc. are all available. The new Astra is up to GBP2,200 less expensive than the outgoing model with a simplified range. The new UK line-up consists of Design, Tech Line, Energy, SRi and Elite specification, with Nav versions of the SRi and Elite trims listed separately, as usual, for company car user tax reasons. Entry level Design prices start from GBP15,295 on-the-road, GBP150 less than the outgoing model, for the the one-litre I3, Turbo Start/Stop ecoFLEX model which includes 16-inch alloy wheels, LED daytime running lights, six airbags, air conditioning, audio system with digital radio, seven-inch colour touchscreen, USB & aux in Bluetooth connectivity, multi-function trip computer, cruise control and steering wheel controls and electric front and rear windows. Range options include OnStar and next generation IntelliLink, cruise control with speed limiter, advanced park assist, rear view camera, side blind spot alert, the IntelliLux LED matrix lighting, a powerflex bar (to charge items like phones and tablets), air wellness fragrance defuser, LED rear lights and 18-way adjustable driver’s seat with massage function, ventilation and seat-width setting. Astra has come a long way since an AM pushbutton radio was a notable standard fit.